Lai YJ, Hsu TY, Lan KC, Lin H, Ou CY, Fu HC, Tsai CC. Asymptomatic pyuria in pregnant women during the first trimester is associated with an increased risk of adverse obstetrical outcomes. Taiwan J Obstet Gynecol. 2017 Apr;56(2):192-195. Su YT, Lin PY, Huang FJ, Kung FT, Lin YJ, Tsai YR, Lan KC. Age is a major prognosticator in extremely low oocyte retrieval cycles. Taiwan J Obstet Gynecol. 2017 Apr;56(2):175-180. Lin PY, Huang FJ, Kung FT, Lin YC, Chiang HJ, Lin YJ, Lan KC. Reassessing the feasibility of the zygote score for predicting embryo viability in IVF/ICSI using the GnRH antagonist protocol compared to the long protocol. PLoS One. 2017 Feb 2;12(2):e0171465. Cheng LY, Lin PY, Huang FJ, Kung FT, Chiang HJ, Lin YJ, Lan KC. Ectopic pregnancy following in vitro fertilization with embryo transfer: A single-center experience during 15 years. Taiwan J Obstet Gynecol. 2015 Oct;54(5):541-5. Chiang HJ, Lin PY, Huang FJ, Kung FT, Lin YJ, Sung PH, Lan KC. The impact of previous ovarian surgery on ovarian reserve in patients with endometriosis. BMC Womens Health. 2015 Sep 10;15:74. Lin YJ, Lan KC, Huang FJ, Lin PY, Chiang HJ, Kung FT. Reproducibility and clinical significance of pre-ovulatory serum progesterone level and progesterone/estradiol ratio on the day of human chorionic gonadotropin administration in infertile women undergoing repeated in vitro fertilization cycles. ReprodBiolEndocrinol. 2015 May 13;13:41. Tsai YR, Huang FJ, Lin PY, Kung FT, Lin YJ, Lan KC. Clinical outcomes and development of children born to couples with obstructive and nonobstructive azoospermia undergoing testicular sperm extraction-intracytoplasmic sperm injection: A comparative study. 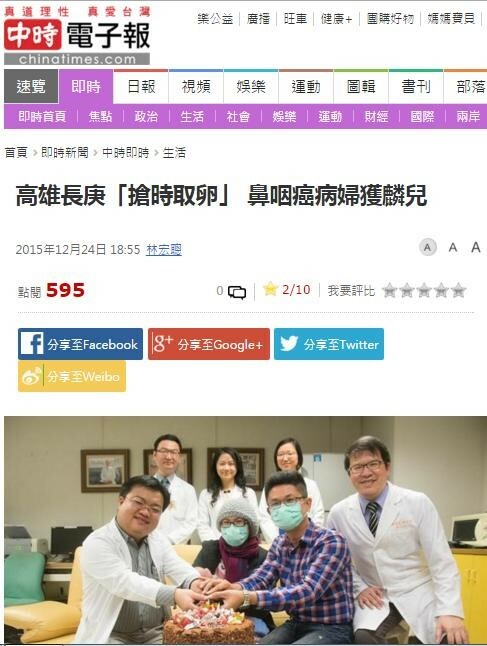 Taiwan J Obstet Gynecol. 2015 Apr;54(2):155-9. Tsai YR, Huang FJ, Lin PY, Kung FT, Lin YJ, Lin YC, Lan KC. Progesterone elevation on the day of human chorionic gonadotropin administration is not the only factor determining outcomes of in vitro fertilization. FertilSteril. 2015 Jan;103(1):106-11.